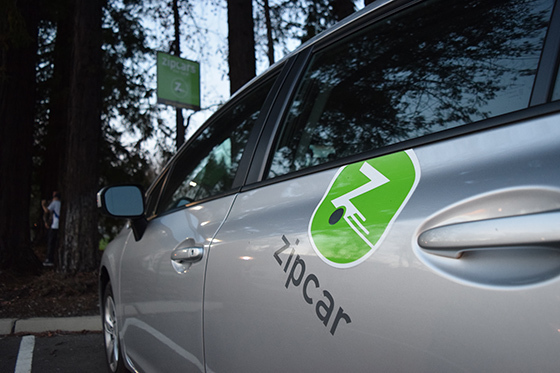 The car rental service Zipcar has landed at Sonoma State University. The convenient transportation option is now available 24 hours a day, seven days a week for students, faculty, and staff ages 18 and older, as well as members of the local community over the age of 21. Sonoma State is initially offering two vehicles, a Ford Focus and a Honda Civic. The Zipcars have designated parking spots in Parking Lot D for convenient pick-up and return. Sonoma State members can join Zipcar for $15, with rates for vehicles on campus starting as low as $7.50 per hour and $69 per day. After the first year, members will pay an annual membership fee of $35. Gas, insurance and up to 180 miles of driving per day are included in Zipcar rates, and cars can be reserved for as little as an hour or for multiple days. Sonoma State students, faculty and staff can join Zipcar at www.zipcar.com/universities/sonoma-state." Zipcar is a great alternative transportation option for our community members here in the academic setting," says SSU Police Chief Nate Johnson. "It provides convenience and helps the environment." The Zipcar mobile app can be used to make reservations, lock and unlock the vehicles and honk the horn to help locate the vehicle. Reservations can also be made over the phone or on Zipcar's website. "The Zipcar program on campus gives students, faculty and staff the freedom of using a car without the hassles of owning one," says Katelyn Bushey, Zipcar director of university sales. "We're happy to partner with Sonoma State University to give their community a transportation option to fit their needs and their wallets." With the new Zipcar program available on campus, student organizations at Sonoma State also now have the opportunity to participate in the "Students with Drive" grant program sponsored by Zipcar and Ford Motor Company, which provides students with Zipcar membership and driving credit to support student organizations on campus. For more information visit www.zipcar.com/studentswithdrive. Zipcar has established relationships with more than 500 universities across North America.